Kelp is just one type of fertilizer. Learn more here. Seaweed or kelp meal fertilizer makes a great organic amendment to garden soil. It's an excellent bioactivator, waking up all the microbes in the soil to help break down organic matter and make it available to plants. It also contains macro and micro nutrients, trace elements, and vital resources. Whether you live on the coast or inland you can add kelp meal fertilizer to the garden. Kelp is a type of seaweed that's harvested in the oceans or along the shore from seaweed that washes ashore. Some people call any seaweed kelp, but kelp refers to one specific type of aquatic plant. Organic gardeners love to compost plant material such as grass clippings, leaves, vegetable peels and others to create a rich, organic fertilizer. Out of all the plant material available, organic gardeners swear by seaweed and kelp meal fertilizer for many reasons. Abundant source of bioactivators: Bioactivators are organic (living) materials that help break down other materials. In the case of compost piles and garden waste, bioactivators trigger the biological process of decomposition. If they're abundant in the soil, they do several things. First, they break down the remains of plants into their chemical components, which makes them available in a form plants can use in the garden. By breaking down plant material, they also enhance the soil structure. They can also be added to existing compost piles if the pile isn't decomposing quickly to trigger the natural process of decomposition. Rich source of NPK: NPK stands for nitrogen, phosphorus and potassium, the major three elements found in every type of fertilizer and the macro nutrients plants need to survive. Kelp meal fertilizer tends to have slightly more potassium than other fertilizers, which helps plants develop strong roots. Include micro nutrients and trace elements: Kelp and seaweed contain an abundant amount of various micro nutrients and trace elements. These are absorbed through seawater and made available when the kelp and seaweed breaks down again in soil. Breaks down quickly: When added to the compost pile or garden, kelp in its natural, harvested form breaks down more quickly than grass clippings or leaves. Sustainable source of fertilizer: Kelp grows quickly in the oceans, and while over harvesting can be a problem, most kelp is gathered at the shore. 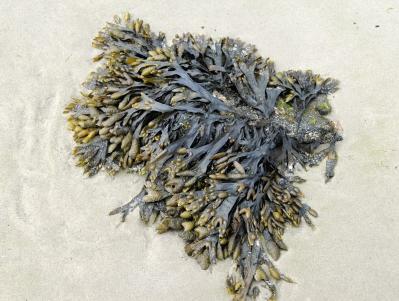 If you live near the beach and it is legal in your area, you can gather up as much kelp and seaweed as washes ashore and take it home to your compost pile. Just be sure to check local laws to make sure you are not illegally harvesting something from a state park or a protected area. Completely organic: It's 100 percent organic, and an excellent soil-builder for organic vegetable gardens. Salt: Because kelp is harvested directly from the ocean, using it straight from the beach and in the garden may add additional salt, which is unhealthy for plants. Fortunately, you'd have to add a huge amount, much greater than most gardeners will ever add, for the salt to build up. Commercially prepared seaweed fertilizers do not usually pose this problem. Worms hate it: Worms are a gardener's best friend. They may be slimy and gross to some, but they perform invaluable tasks in the garden. Their tunneling action aerates soil and creates small tunnels, allowing water to reach thirsty plant roots. They eat decomposing vegetation and excrete worm castings (feces) which are rich in fertilizer for plants. Lots of worms in the compost pile means a healthy pile, at just the right temperature and full of food that worms love. Unfortunately, worms won't touch fresh kelp. Kelp fertilizers from commercial vendors shouldn't matter to worms. However, if you are able to add fresh kelp to the compost pile, know that your worm friends will turn their imaginary noses up at it. Use kelp and seaweed meal fertilizers according to the package directions. Most come as a powder or granular formula, and depending on the concentrate will be applied directly to the soil. You can make a kelp meal tea by adding some kelp meal to a gallon of water. Stir, and water plants with it.Foliar sprays using seaweed and kelp fertilizer provide an excellent source of fertilizer to stressed plants. Foliar sprays are excellent for most types of plants. Add organic kelp or seaweed fertilizer to about a gallon of water, stir, and add to a sprayer. Spray leaves according to package direction and plant needs. To purchase kelp fertilizer, visit your favorite home and garden store, garden center, organic gardening store, or the following websites. Clean Air Gardening sells a five-pound bag of organic kelp meal that should last most gardeners a while. Kmart sells Espoma brand kelp meal in a four-pound bag. Sears sells several brands of kelp meal, including Neptune's Harvest, Espoma Organic, and Down to Earth.